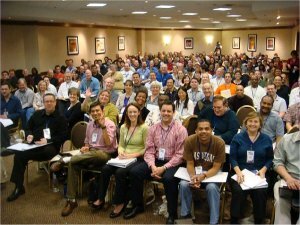 Could attending an internet marketing seminar put your business on the fast track? During my early twenties, while stationed in the frigid northern Canadian town of Timmins, Ontario, I took a number of University of Waterloo correspondence courses, with the hope of earning my degree and a way out of that frozen wasteland. Did I learn a lot? Absolutely! Did I benefit from the information? Again, absolutely! What would you like to know about Christaller's ‘Central Place' theory? Did I get my degree? Errr…no, I did not. For me, the distance learning process was difficult and sorely lacking. I found it hard to motivate and discipline myself to study on my own schedule. After listening to an audio-taped lecture, I couldn't simply raise my hand to get answers to my questions. Indeed, who were those people who were spouting their infinite wisdom? Were they graduate students, or bonafide experts with practical experience in their field? Getting feedback on submitted assignments took weeks by snail mail. There were no other students with whom to share ideas and concerns. More importantly, where were the rabble-rousing all-night parties that were supposed to be part of my University experience? On-campus university students usually take 4 or 5 courses per semester to earn a degree in 3 or 4 years, but a correspondence student with a full-time job is hard-pressed to complete just 2 courses per semester. Taking ten years to complete one degree wasn't likely to impress potential employers in the Sunny South. All in all, I felt like I was going to freeze to death in the vacuum of distance learning. Trying to build a successful Internet or affiliate marketing business by studying ebooks is a little bit like trying to earn a business degree by correspondence. Sure, you can do it, and I highly recommend that you take advantage of all educational material relevant to your online ventures. However, while some students do very well with distance education, most of us learn faster and more easily when we can see and hear our teachers, and get answers to our questions as they come up. For example, how many books would you have to read to equal the value of two or three days of multi-media presentations, on a variety of related topics, in an environment where you can ask questions and exchange ideas with both teachers and students? Three, four – even five? How long would it take you to read five books? A week? A month? More? No, really. You're a busy person. You've probably got a full-time job, a family, friends, a home to take care of and other pressing obligations. After spending 10 hours commuting to and from work, 40 hours at work, 49 hours sleeping, 20 hours with your family and friends, 15 hours eating, 7 hours maintaining your home and another 10 hours maintaining your muscles; there's not much time left in the week to do your ‘required reading' – IF you have the discipline. And have you ever met the person who wrote the ebook that you're currently reading about copywriting? Do they really practice what they preach? Wouldn't you rather learn marketing, sales, and copywriting strategies first-hand from self-made millionaires who use those same techniques everyday; than from ‘pick and shovel sellers' who sell only money-making guides? Instead of spending months and months learning on your own, what if you could spend just two or three days at a seminar learning about every topic that is important to you as an Internet entrepreneur? How much more quickly would your business become profitable? The truth is that ‘pick and shovel sellers' don't and can't speak at seminars because they can't answer your tough questions…and you need answers to your tough questions. You can get all of your questions answered in the space of a weekend. All you have to do is show up, listen and ask. Probably more than the copious amounts of great information that you'll take away from a seminar, is how inspired you will feel after hearing ‘ordinary' people tell their extraordinary success stories. There is incredible power and motivation that comes from meeting self-made millionaires in person and being able to see that they are as ‘real' as you or I. Learning that they too worked hard, made mistakes, and yet achieved the dream of true financial freedom will fuel a fire within you that burns long after the seminar is over. Meeting your mentors and making friends at these events is another valuable benefit. How great would it be to just pick up the phone and talk with someone who understands your business? Can you do that now? Attending a seminar isn't cheap, however. It often costs several hundred to a couple thousand dollars just to get in the door, and that doesn't include your airfare or accommodation. Though in many cases, you should be able to write off those expenses against your future earnings. If you're worried about the price of going to a seminar, consider what Nigel Botterill of Solihull, West Midlands, U.K. had to say about his experience during and after attending one of Yanik Silver's seminars. “I came across from the UK for the event knowing nothing about ‘Information Marketing'…I want you to know just how bloody useful the whole thing was. I'm very grateful to you for putting it all together. Within five weeks of the event I had launched my first product. “Within nine months of the event, using the techniques and tips that I learned from all the fantastic speakers at your Birthday Bash, I have generated well over one million dollars in sales from that single product. It has been incredible. All this with no previous experience – just the education I got from three days in Florida! “I've closed down my ‘old' business, changed my entire way of life, and am having so much fun. So, will YOU earn a million dollars from your fledgling Internet business in the next nine months, or even just a few thousand? Or will you still be struggling to figure out how to build your first web site? But if you want to put yourself on a fast-track to success, attend a weekend seminar and meet your mentor today!